Yep, everything is truly negotiable. Even frozen meat. Have you ever bought anything off of a frozen meat truck? I hadn’t either until last November. But one those went cruising around our neighborhood on Black Friday and made me a deal I couldn’t resist. 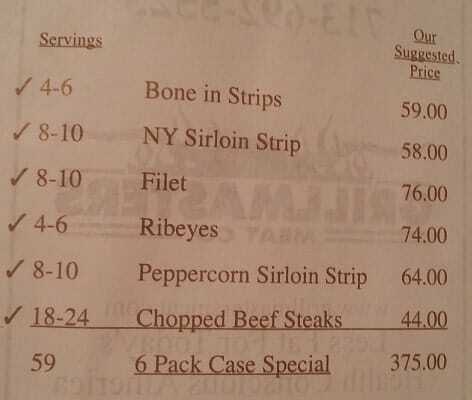 They were having a half-off sale, so their beef box was $185 instead of $375. I hesitated and asked if they could do any better, and they came down to $150. It may be lazy, but I jumped on it since I would have paid at least $115 at our Kroger for the same cuts and these were all individually freezer packed for us, which is priceless since I hate using our vacuum sealer. Plus, we each can have whatever cut we crave on any given night. This is what the beef box case looked like on paper last November. We only had a few left of a few boxes. All of the hamburgers and peppercorn strips were devoured by January. Yesterday, the main competitor of the guys I bought from last November knocked on my door. They handed me their brochure and they really had nearly identical options. But their “special” was to buy a beef box and get a box of chicken, pork, or seafood free. I didn’t want any of those. And their beef box was $349! I said that I loved beef but I couldn’t pay more than I did last time and explained my last experience. I also asked if they would wait for a second while I grabbed my receipt and brochure from November (I am actually finally organized enough to know where I put it!). So I grabbed that proof and handed it over. The more experienced of the two sales guys made a big deal of “matching their competitor’s prices” and offered me the beef box for $150 while mumbling to the new guy that they usually should stick to around $180. I don’t know if I was supposed to hear that last part or not, but it did make me feel good. So well played, sir! Spending $150 on individually packaged beef cuts may seem crazy to a lot of you, but that is not the overall point I am aiming for. Please keep in mind that everything is negotiable – even frozen meat. And not just a little negotiable – A LOT NEGOTIABLE. They probably list $350 and aim to get at least 50%-75% of that ($175-$250). It paid to keep my receipt from my last purchase. It also paid to simply let them know what I needed in order to work out a deal. Have you haggled lately? Buy anything off of frozen meat trucks? Wow, a frozen meat truck!I’ve never heard of one of those before. We don’t usually get food trucks like that where I live, but we have recently learned about being able to haggle at the farmer’s market where we usually buy our veggies. What amazed me most about reading this is that your HoA has problems with you having guests over now and then, but apparently has no problem or control over door to door beef salesman running rampant through the neighborhood. Which, by the way, until now is a concept I have never been familiar with. Maybe a southern thing? It’s always good to haggle when we buy things. It’s worth a try if you can bring the price down. Plus, I agree with you, it pays to be organized! I want to emphasize that all you did was ask a question which is the first step in negotiation. You could walk away and so could they. I do this often and the other party usually will respond with a lower price. 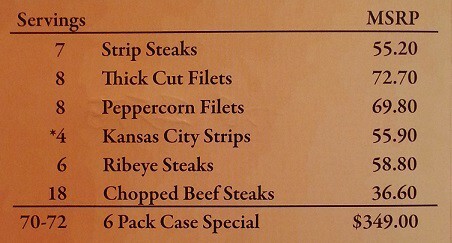 BTW,I would never buy that much beef because I only eat beef about once every 2 or 3 weeks. Independent door to door frozen meat has been sold down in this area, since the beginning of neighborhoods. Used to be that local fishermen would go door to door selling fish that the local fish store wouldn’t buy from them. Swansons has a frozen meat and appetizer truck that makes bi weekly runs around the neighborhood. HOAs don’t have the authority to enforce their deed restrictions on incoming sales people. So their restrictions are simply their to punish their members. The city sells sales permits so they can collect taxes, but never seem to enforce the city codes either. When we lived in Holland, the milkman not only had any dairy product known to man, including vla, but also the best chilled beers on the planet. He would only make deliveries to his route, but would always sell to the curious too. We lived in a suburb filled with expats as well as professional workers, so there was a need and demand .for the service. Well done Crystal. I always start feeling sorry, and cave in and pay too much. Seems a lot of work for a profit, but most time those sales people are just re-sellers. They need repeat customers to prove they were invited , and are not door-to-door cold selling, generally to meet local codes. Yes, everything can be negotiated , as long as you remember you can always close the door or walk away, and don’t get worn down. Wow, had no idea! Thanks for the tip. I didn’t even know that meat trucks existed. I hope boyfriend does catch on to this. He’d definitely be buying meat off a truck. Nice savings! @Kyle, I loved the farmer’s markets in Holland when we lived there (I was in high school at the time). @Money Beagle, not sure if it’s just southern or not, but they’ve been around longer than I’ve been alive. 🙂 And yes, there are signs that clearly say “No Soliciting” but it doesn’t stop anyone. @My Multiple Streams, it definitely does! Nice. You did good negotiating for those meat. And good job for keeping that receipt. Maybe I should do the same if one of these meat trucks passes by. @KC, let me know how it goes!